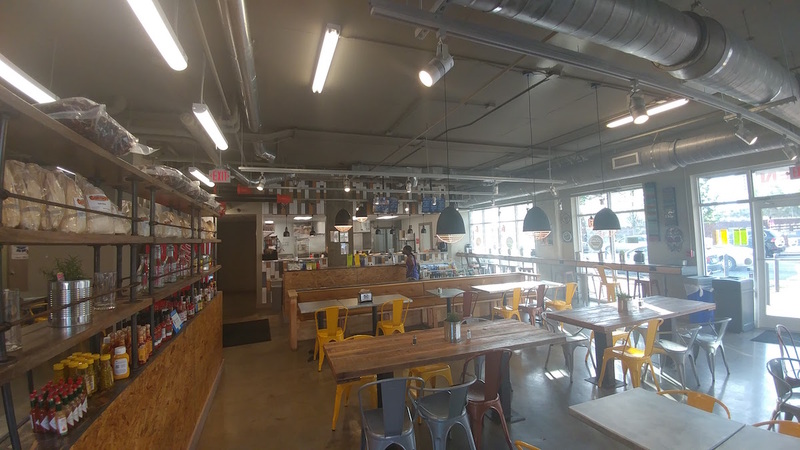 Cosecha Urban Kitchen is a Fresh Take on Mexican Food in Birmingham! 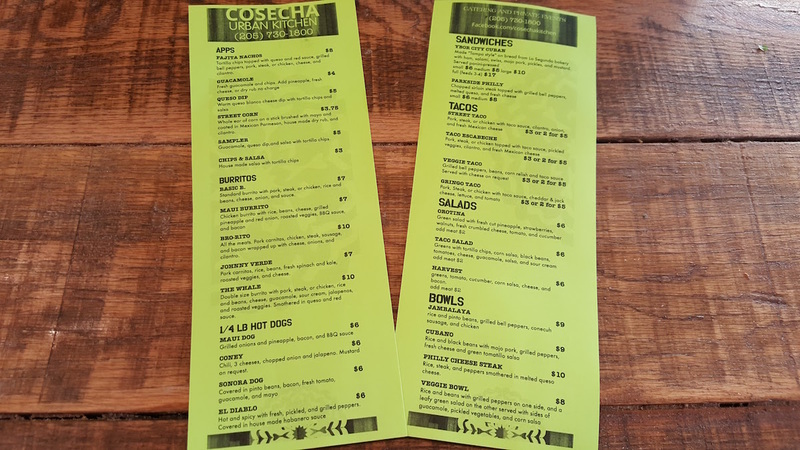 We stopped by Cosecha Urban Kitchen for some Delicious Dishes! The Birmingham Barons begin their season this week which means you’ll have a great reason to try Cosecha Urban Kitchen! Located near the stadium in the corner of Parkside Apartments, Cosecha serves up hispanic food that’s as affordable as it is delicious! First things first. It’s pronounced “Co-Set-Cha” and is the Spanish word for “Harvest.” The name is a great fit considering the fresh ingredients that go into each dish that they prepare. When it comes to downtown dining, this is a great addition to the mix! 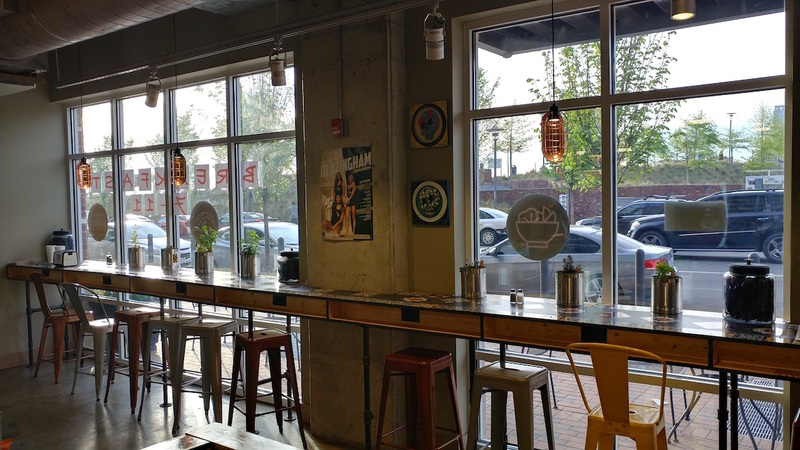 We hope you enjoy this recap of our recent experience at this great fast-casual restaurant! We headed over to Cosecha on a Monday night around 6pm. Did you hear that, Birmingham?! A downtown restaurant that’s open on a MONDAY!!! The first thing we noticed were the hours of operation. They are open 7days a week from 7am-10pm and are open until 11pm on Friday and Saturday. Just recently, after attending McWane After Dark, we struggled to find a downtown restaurant that was open after 10pm on a Friday. If only we had thought to check here! Cosecha also serves breakfast from 7am-11am (until 2pm on weekends), but we will get to that later. For our appetizer, we ordered the “Street Corn.” Amber loves getting this from food trucks and vendors at festivals, but it’s often not made in the traditional way. That wasn’t the case here. 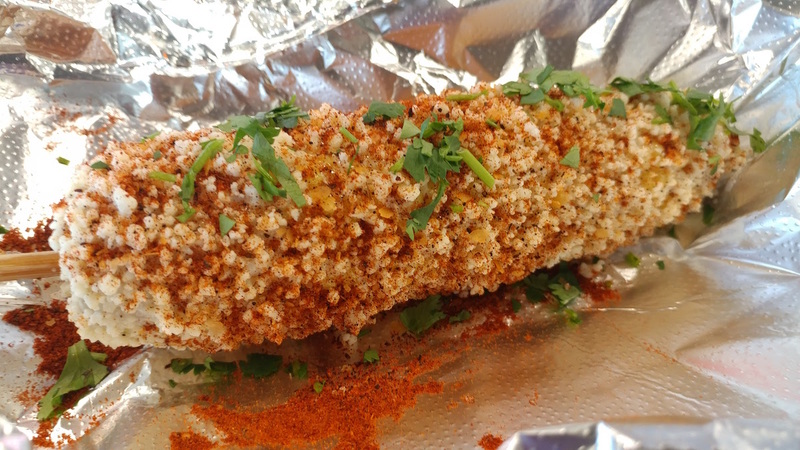 The corn came brushed with mayo and covered with Mexican Parmesan along with a house made dry rub! It definitely hit the spot and was less than $4! Next we ordered two of the tacos. They were served in foil just as if they had come out of a food truck. 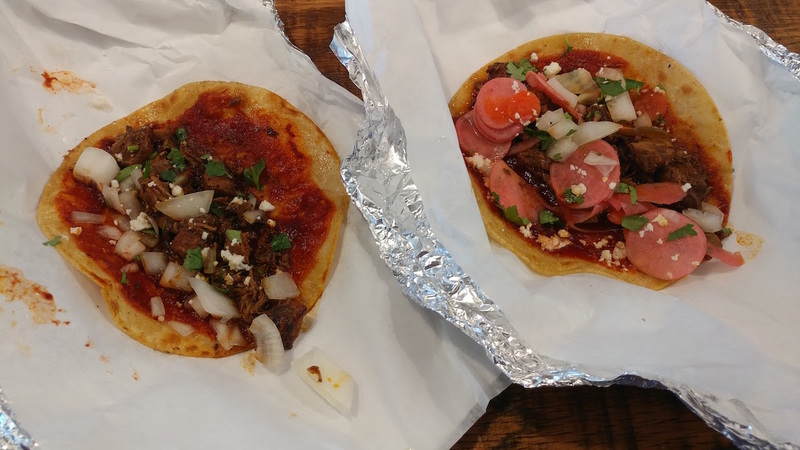 We tried the “Street Taco” with pork and the “Taco Escabeche” with steak. Both were made with fresh ingredients and served with the traditional corn tortilla. These are great for a light snack or for a meal if you’d like to sample a few different kinds. The taco sauce on the Street Taco had a medium kick and the veggies on the Taco Escabeche had a great pickled flavor! (Escabeche refers to the process of pickling a dish.) Delicious! 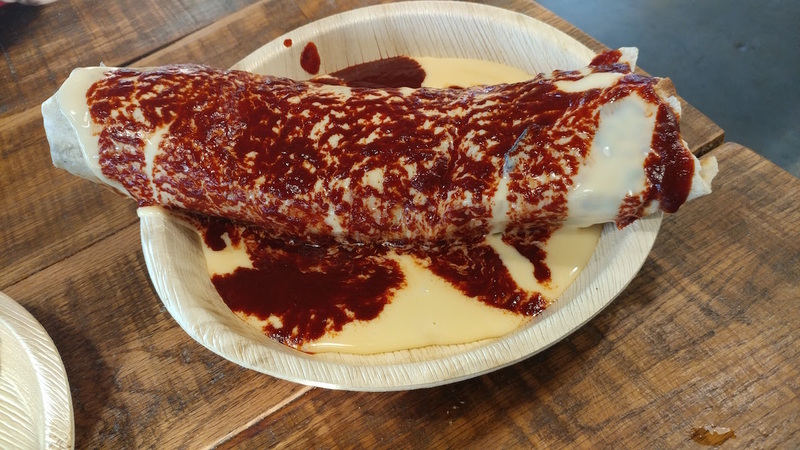 Next up was the Burrito they call “The Whale” and rightly so! It’s a “double-sized” burrito that can barely fit on the plate! 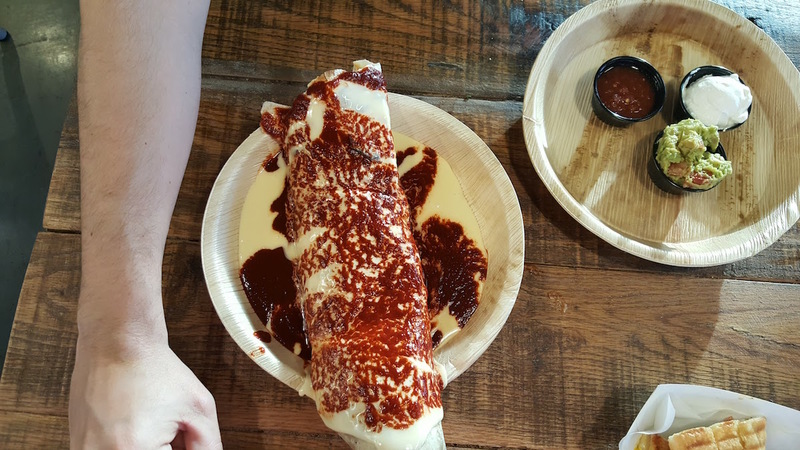 Truth be told, when served the ends of this burrito are hanging off, so don’t worry if some queso gets on the table. It’s all part of the experience. Speaking of queso, The Whale comes smothered in it! It is also covered in a red sauce that Bubba tells us takes 3 hrs to make fresh! They chop up the peppers for the sauce in house. The Whale is stuffed with rice, beans, cheese, guac, sour cream, roasted veggies, and a meat of your choosing. It can easily feed two people! This behemoth of a burrito is just $10 and can easily make for two meals! We savored every bite. At this point, we’d like to use the excuse of being bloggers to justify ordering yet another item. 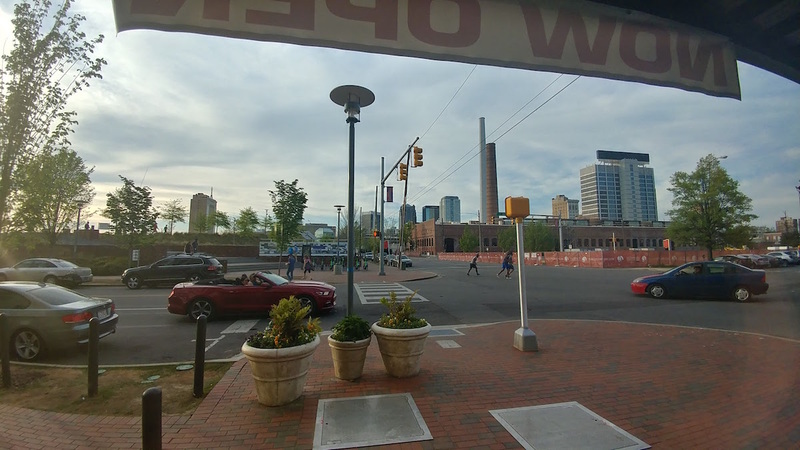 While Cosecha Urban Kitchen has a great view of the Zyp Bike station at Railroad Park, we did feel just a tinge of guilt watching dozens of people jog by the windows on their evening run. 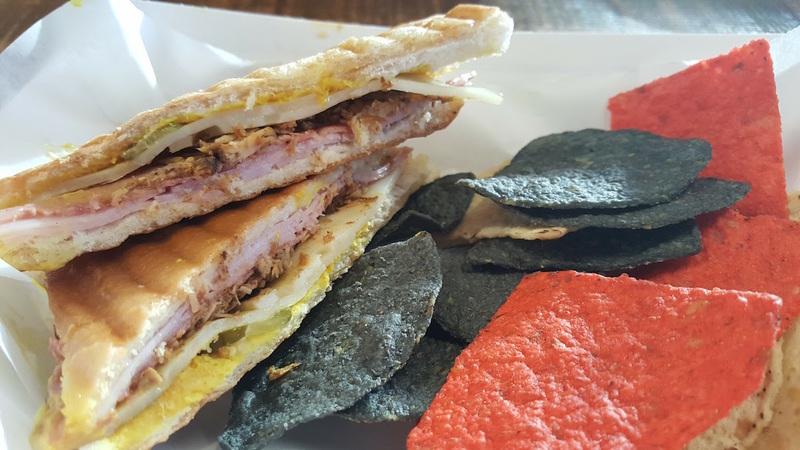 The last item we sampled was the “Ybor City Cuban” sandwich. This item has a few cool features. It comes in 4 sizes: Small, Medium, Large, or “Full.” The “Full” version comes on an entire loaf of Cuban Bread and can feed 3-4 people! This is great for sharing with friends. Speaking of the Cuban Bread, this particular bread is shipped out of Tampa’s La Segunda Bakery. The owners made special arrangements to get the authentic bread shipped to Birmingham, so Cosecha is the only place you’ll find it locally. This panini-pressed sandwich includes ham, salami, swiss cheese, pickles, “mojo-pork”, and mustard! We ordered the “small” which was still the size of an average sandwich served in two halves. As the meal was winding down, we talked to Bubba about their happy hour and breakfast options. Cosecha has a nice bar area in the back of the restaurant with plenty of great drink options to choose from. We went back Wednesday morning to try the breakfast menu and the Breakfast Burrito was incredible! It is filled with eggs, cheese, hoe-cake style pancakes, honey, and a meat of your choice. We went with Conecuh Sausage! Bubba also told us that they are planning on adding a Bloody Mary bar on weekends! While we were indulging in our meal we noticed that there are outlets with USB ports all along the window seating, so this makes Cosecha a great place to charge your mobile device or laptop while enjoying a nice view! We did sneak a sample of the “Cuban Brew” flavored coffee they had and it was delicious! Every time a customer walked in, Bubba was quick to greet them, introduce himself, and ask their name. He would then tell them to have a great night as they left, being sure to remember and use their names. While Cosecha is co-owned by Justin White and John Green, Bubba told us that he wants patrons to feel like guests in his home. 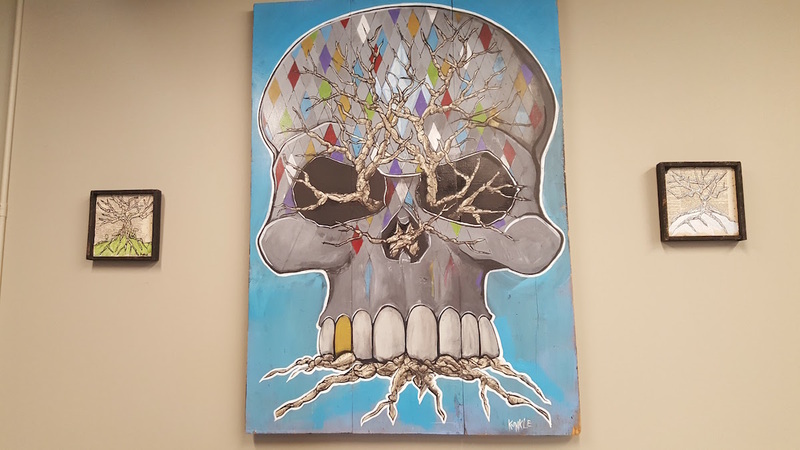 With local art adorning the walls and a friendly staff that took care of us, we definitely did! 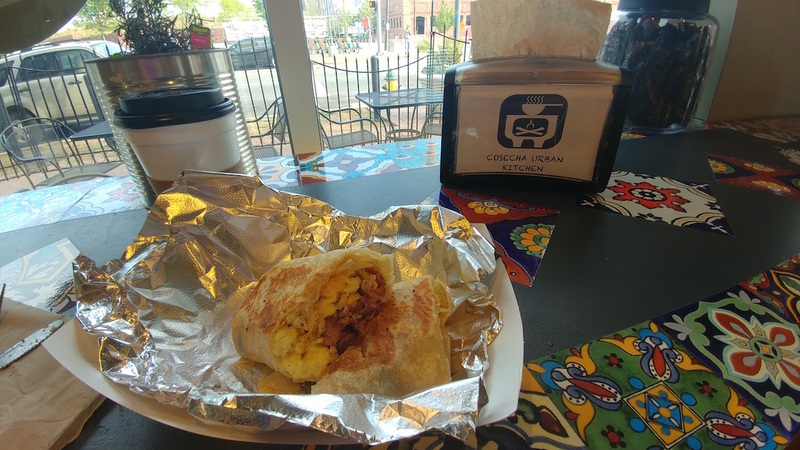 Next time you are on the way to a Barons game, needing some breakfast downtown, trying to find some late night eats, or just in the mood for some delicious food at a great price be sure to give Cosecha Urban Kitchen a try! You’ll probably spot us there! Now excuse me while I go tackle the 2nd half of The Whale Burrito we brought home with us!